Black Friday has come and gone, but that doesn’t mean the holiday shopping rush is over — far from it! Do you have a hard time finding the perfect gifts for the favorite people in your life? This fitness gift guide features some of my current faves (and some things that are on my wish list!) — check out these ideas and add them to your shopping list! 1. Fun Gear — I don’t have a ton of selection when it comes to dressing up and going to the gym. This fun fitness Trifecta tank top from Rokfit is perfect for anyone who wants to make a statement during fitness events or completing a workout at the gym. And honestly, who doesn’t love coffee and bacon? 2. Cookbooks — Cooking the same thing over and over gets boring, so how do you mix it up in the kitchen while staying healthy? 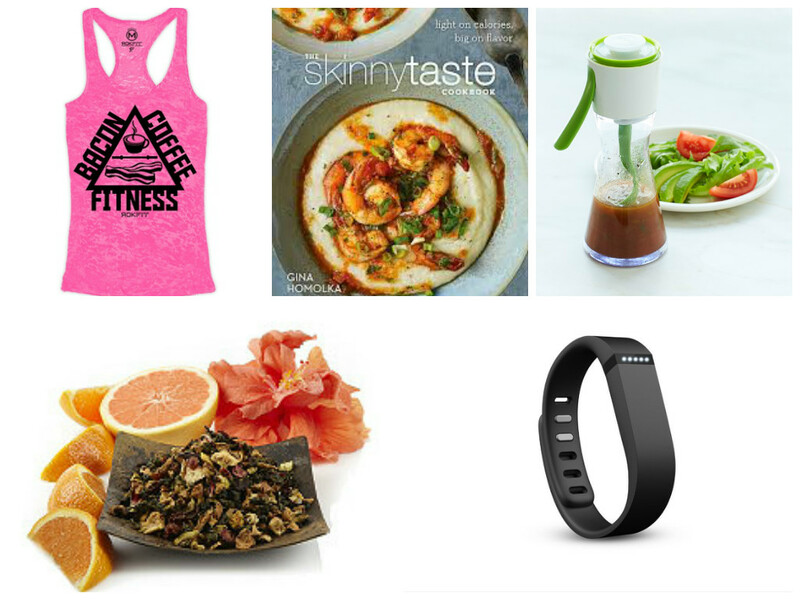 You buy Skinnytaste by Gina Homolka! So many delicious recipes that are light on calories and Weight Watchers points without lacking in flavor. 3. Kitchen Gadgets — After the holidays, everyone’s going to be eating much healthier and lighter, so it makes perfect sense to gift kitchen gadgets — such as the Willams Sonoma Chef’n Salad Dressing Emulsifier. Making dressing from scratch is simple and tastes infinitely better than the bottled stuff. Plus, it’s the perfect healthy holiday gift that will be used all year long! 4. Gourmet Tea — For those of us watching our weight, tea is a tasty drink that keeps us hydrated and is low in calories/WW points. Instead of the typical tea varieties at the grocery store, gift that special someone with a gourmet blend! Teavana has so many options — Wild Orange Wulong Oolong Tea sounds amazing. This is a gift essential for those who love loose-leaf tea drinks! 5. Activity Monitor — There are so many activity monitors out there, it could be hard to choose the right one to gift a friend or family member. Fitbit is one of the most popular fitness gadgets, and quite frankly, I am so in love with it I think everyone else should have one, too. The Fitbit Flex (as well as the Charge, One and Zip) boosts motivation and gets people moving! Are you still in a food coma from Thanksgiving? Don’t want to pack on the pounds before Christmas? Get through the holidays on track and staying in shape with the Skinny Snowman Challenge hosted by Brooke: Not on a Diet! I’ve done the Skinny Snowman Challenge and can say that it kept me on track and motivated to make good choices all through the holiday season. If you want to sign up, hurry up — it starts November 30th and runs through January 3rd! This year, there is a $5 entry fee, which makes perfect sense given all the work Brooke does to keep the challenge running, PLUS you get access to a Meatless ecookbook to enjoy on those Meatless Mondays and the point print outs needed to keep track of your score. You will purchase access to the challenge (only $5) which has a chart filled with daily & weekly challenges. As you complete this challenges, you earn points! At the end of the week, you send in your weekly points total and will be entered to win the weekly prize. At the end of the 5 weeks, the top 3 people will win one of the grand prizes! Weekly prizes and grand prizes are going to be handed out — so it gives you even more motivation to earn as many points as possible. Be sure to head over to Brooke: Not on a Diet to sign up so you get started in time! There has been plenty of buzz out there with Weight Watchers members about the ActiveLink 2.0 — and it’s always fun when a new gadget comes out. If you’re paying week-to-week, it’s definitely a good time to make the switch to the monthly pass, or if you are planning on becoming a member, now’s the perfect time to do it and stay on track during the holidays. Sign up here, or visit your local store to take advantage of this amazing offer. If you want to get some feedback on the new features of ActiveLink 2.0, be sure to check out Brooke’s review here or Mel’s video blog here. Can someone explain how Thanksgiving is a little over two weeks away? Okay, where did 2014 go?! The holidays aren’t really a big trigger time for me. I bake a little, but mostly give it away to just the few friends and family we have around here. I do love Thanksgiving dinner — turkey breast, mashed potatoes and gravy, rolls and green beans. That’s about all I want this time of year! So the whole holiday gain thing isn’t a big worry of mine and in fact I am usually more diligent about tracking throughout the holidays than other times of year. Go figure. This year, we have signed up for our second 5k of the year — the Long Beach Turkey Trot. There’s no official time (and no medal), which I wish I would have paid attention to before signing up, but the race fee goes to charities around Long Beach so that’s always a good thing. I’ll be tracking my own time and seeing how it has improved since our last 5k in September. When we did the Dodgers Foundation 5k, I didn’t know what to expect. Would I be able to finish it? Would everyone be fit and in shape? Turns out, it’s a welcoming experience for EVERYONE. There were people of all shapes and sizes. I was walking at an adequate pace and I saw some individuals out there who were larger than myself — I was so proud of them! To be out walking and taking on a 5k challenge is admirable no matter what the scale says. Our official time was 1:03, but we stopped a few times to take pictures and if you’ve ever been to Dodger Stadium, you’d know there were some killer hills! Luckily, the steep inclines and hills were at the start of the race and the second couple of miles were flat. The Long Beach Turkey Trot winds around a bike path, so it’s going to be flat the entire time — I am fairly confident I will improve on my time, but I’ll post the details here at a later time. Does anyone else have any special challenges or routines to do around the holidays? It’s been a few months since I posted anything on this blog. I needed to step away for a bit — was having a bit of an identity crisis with how I wanted this blog to work. I think I am ready to come back and blog once again. It’s not going to be so much ‘journaling’ as it is going to be me sharing interesting things I find regarding healthy living, recipes I make and anything else I feel like sharing. Going to keep it simple and see where it goes from there! I’ll be writing another blog post this week catching everyone up on what I’ve been doing in the four months since my last post. One thing has remained constant — I am still on Weight Watchers. Even when I’ve gotten off track, I am still thinking about the program. 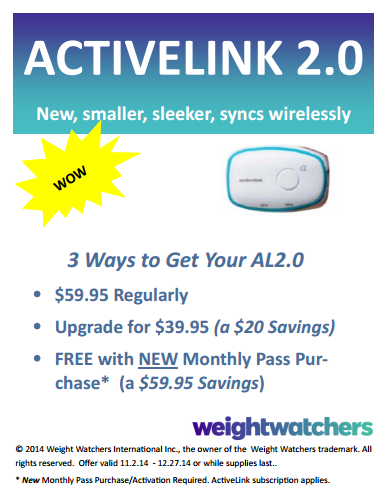 Right now there is an amazing promotion going on with Weight Watchers regarding the new ActiveLink 2.0, which I will be sharing this week as well. Needless to say, if you want to join Weight Watchers to stay on track over the holidays, now is the time to do it! 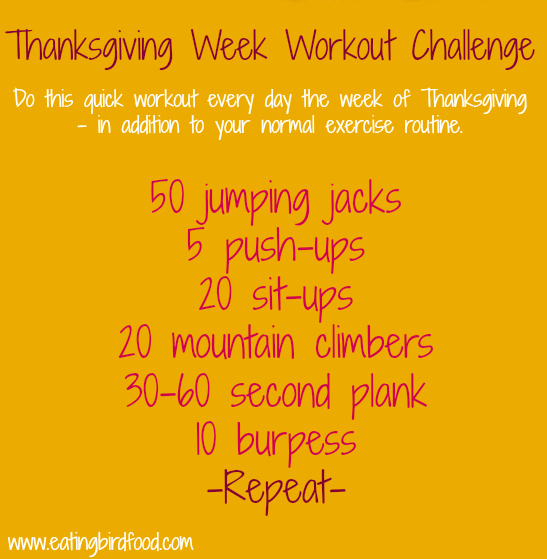 You can sign up here and be on your way to making this a healthy holiday season!